Doo Doo Economics Blog: Is Explosion Near Waco Related to Boston? Doo Doo Economics are the policies of overspending, printing money, neglecting the key economics issues, bad science and promoting entitlement programs which all add up to higher taxes during a recession and economic unsustainablility. Is Explosion Near Waco Related to Boston? A first responder who helped treat victims of the fertilizer plant explosion in West, Texas, last month was arrested and charged today with possessing an explosive device. The arrest came on the same day that Texas authorities opened a criminal investigation into the April 17 explosion. Paramedic Bryce Reed, who works with the West, Texas, EMS and served as incident commander during the response to the explosion, appeared in federal court in Waco, Texas, this morning for alleged possession of a destructive device. A large explosion has occurred near Waco, Texas. 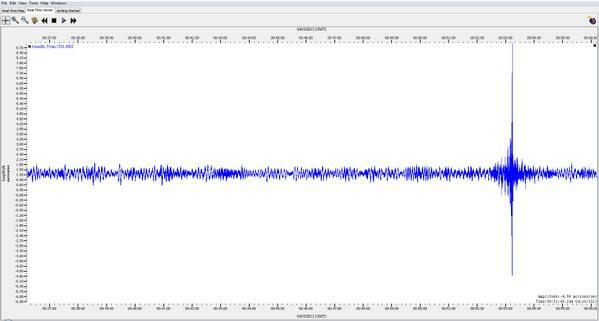 A seismograph in Amarillo (~400m away) registered the fertilizer plant explosion in West, Texas. Sixty or seventy people are reported dead and up to one hundred injured. The information is frrom EMS Director Dr. George Smith. This morning we reviewed the possibility that the Boston Marathon attack might be the first in a series of terrorist attacks. This explosion in Waco might fall into such a strategy and explain why the attackers have not yet claimed responsibility. Al Qaeda may be waiting to claim responsibility until operatives and support members have retreated to safety. We may see a claim of responsibility in a few hours. We will not see a claim of responsibility if further attacks are in progress. An organization with hundreds of members can run a sophisticated support network. However, such networks are difficult to create and they would not want to dissemble it after a single attack. Successful operatives might be planning or executing additional attacks. A rash of attacks, like the ricin senatorial attack, would maximize the terror effect. I wouldn't think the two are related, because al-Qaeda tends to go for historical significance with their attacks. It is still two days to the anniversary of the Waco massacre at the Branch Davidian compound, which occurred on April 19, 1993. I would expect al-Qaeda to not be so sloppy about dates, as that is not there normal style. Al Qaeda has several different factions and affiliate groups under new leadership. 1) The Boston attack occurred on the date that the Osama Bin Ladin raid was approved. There may be a series of attacks planned for a two week period in retaliation for the killing of OBL. 2) It could also be a diversionary attack against a target of opportunity. The crisis would provide cover for terrorists from Boston escaping south into Mexico. 3) Jihadists on April 1st were recruiting on websites for a "9/11 style attack on America." This could represent a general call for terror cells to attack. More terror cells will be close to the Mexican border and along smuggling routes for the Mexican drug cartels. This may including San Diego. i thank the guy for the footage, but he loses parent points on this one. I don't think Boston is domestic at all. For one, the Saudi suspect may family ties to an al Qaeda group related to Benghazi. Second, he cooperated and may have given up two suspects. Suddenly the FBI puts out 2 suspects to the public. Dem Rep Speier: School Shooting Focus on Mental Illness ‘Fundamentally Ignorant’ - [image: Mass Shooters] Democrat Congresswoman calls focusing on mental health to help stop school shootings as "fundamentally ignorant."